Phoblacht na Spáinne in éadan an Fhaisisteachais. of the Spanish Republic against Fascism. 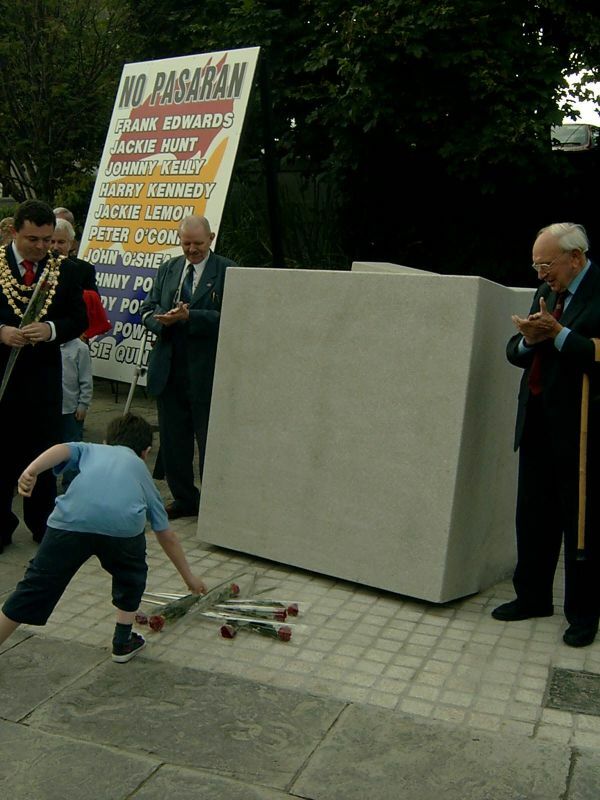 Up to 300 people turned out in the Mall area of Waterford for the unveiling of a monument dedicated to the memories of the 11 men from the area who fought in defence of the Spanish Republic from 1936 to 1938. A few photos have been posted here, and a report from the Waterford Today newspaper can be read below. Another report, with photos by the BBC, can be read here. Overall, it was a great event that came together really well. Luckily the fine weather held for most of the event, only breaking into light rain for a few minutes. 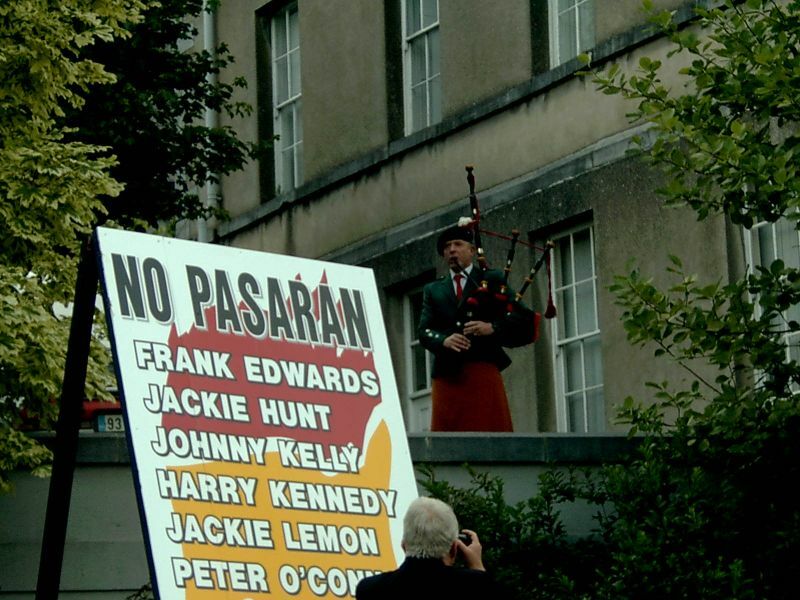 The highlight of the day was Frank Kelly leading the crowd in singing the Internationale (this webmaster has convinced himself he wasn't the only one ‘singing’ in Irish). The flag of the Spanish Republic, with a dedication to the Irish unit. The podium as set up outisde the Bishop's Palace. 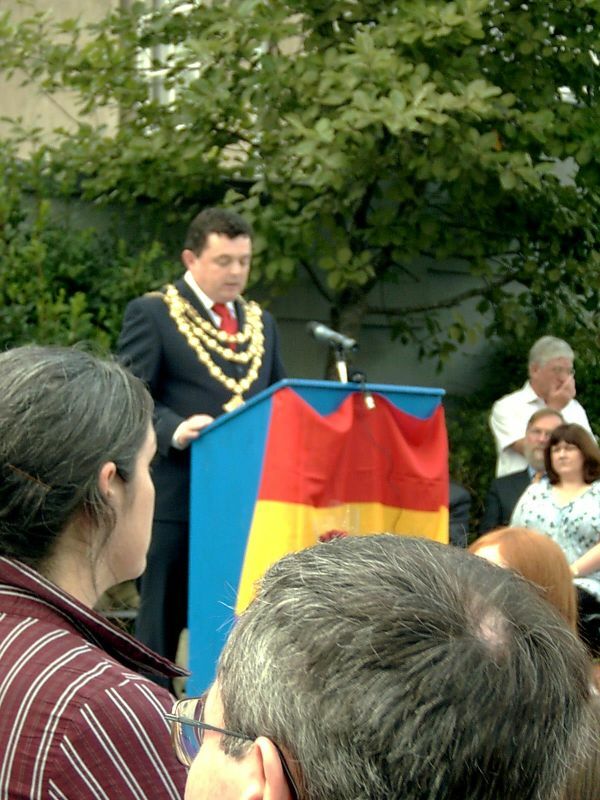 Cllr Séamus Ryan, Mayor of Waterford. Friends of Waterford International Brigaders. Moe Fishman, American veteran of the Spanish Civil War. Secretary of Veterans of the Abraham Lincoln Brigade. Veteran of the British Battalion. Veteran of the Spanish Civil War. 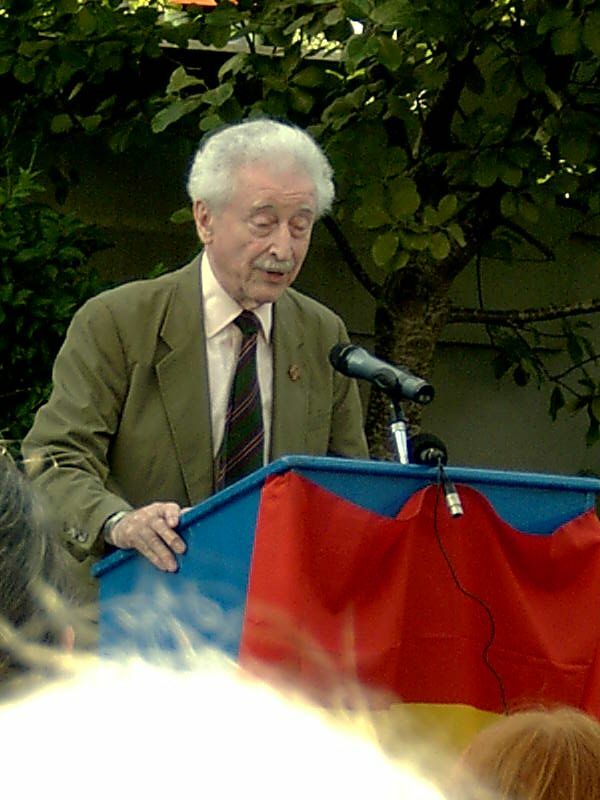 Author of “The Connolly Column”. The guests unveil the monument, a 7-ton rock of Spanish granite. of the veterans and another by the Mayor. Peter O’Connor Poleberry & Parnell St.
Mossie Quinlan South Parade, killed in action on the Jarama front. The fact that we are gathered here today is proof enough that these men did not waste their lives. The Spanish Civil War was a long, bloody and bitter conflict, often overshadowed by the longer and bloodier war that was to immediately follow. While the main Western European powers either stood idly by or supported the Fascists, the democratic government of Spain was attacked by rebels and ultimately destroyed. 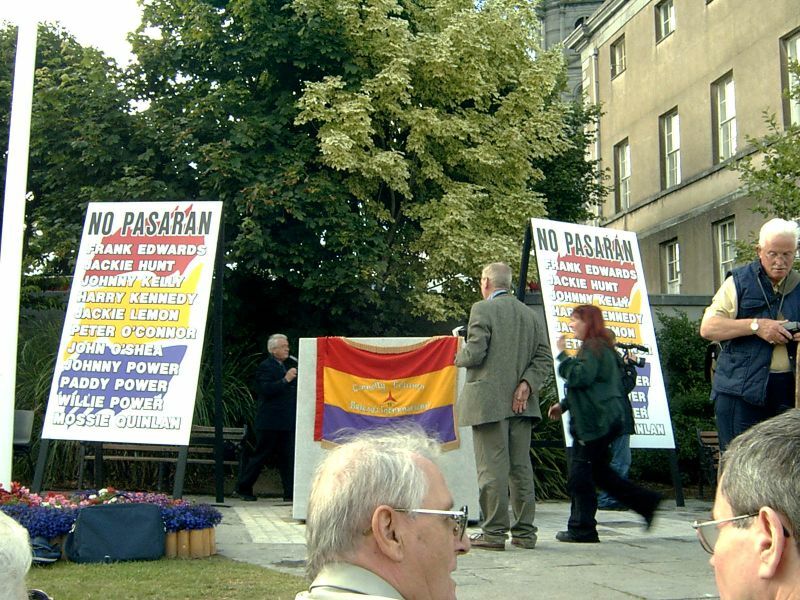 The words of Dolores Ibárruri –La Passionaria-“No Pasaran”-They shall not pass have come to be regarded as the rallying call for the struggle that was to follow. And these words are used on the monument as a reminder to us of the sacrifice of many. Harry Kennedy, the most recent name added to the list. I would like to take this opportunity to thank all those who made this monument possible. In particular I would like to thank Michael Warren for designing this wonderful sculpture. I would also like to thank all members of the memorial Committee for their work in making this event possible”. Dolores Wild a daughter of Sam Wild, a Commander of the International Brigade read La Passionaria’s farewell address to the members of the International Brigade*, while Frank Kelly sang the Internationale. 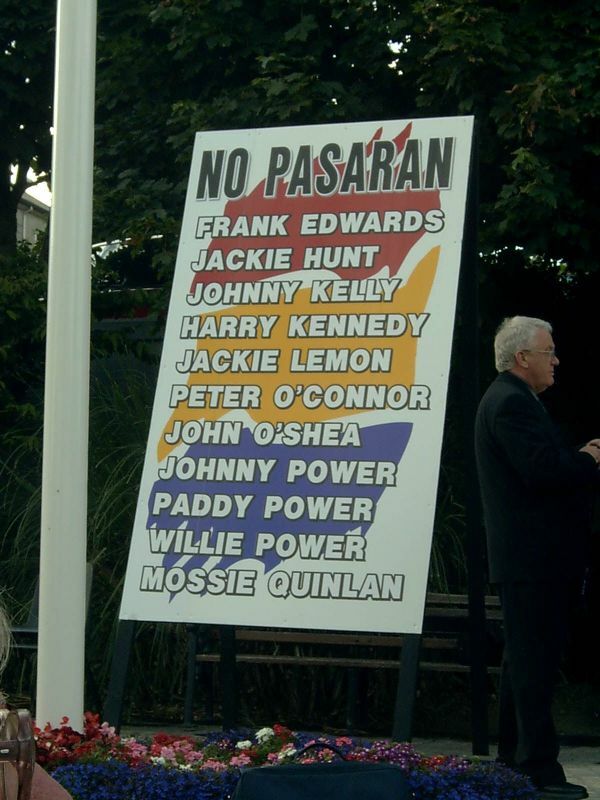 The whole ceremony was superbly chaired by Jim Nolan, Playwright, chairman of the organising committee. 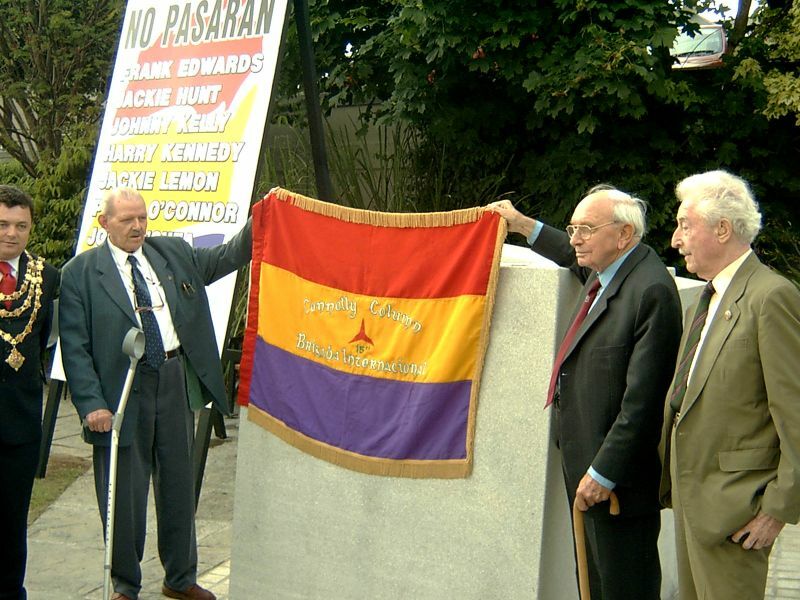 Jack Jones, Britain former general secretary of the Transport & General Workers Union a veteran of the XVth International Brigade said the spirit of determination and self sacrifice was represented in full measure by the men from Waterford who fought in the ranks of the International Brigade supporting the democratically elected Government of the Spanish Republic during the terrible war inflicted on Spain by General Franco and his allies. 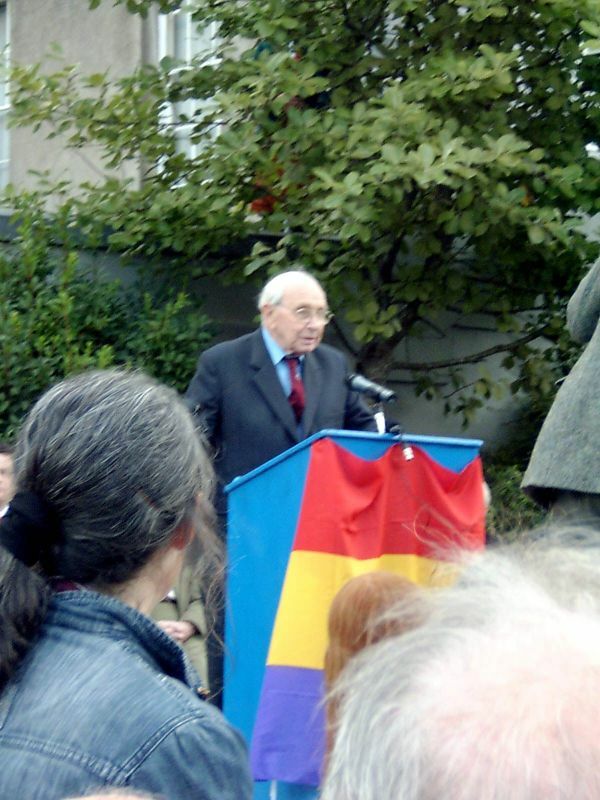 Moe Fishman, another veteran of the XVth International Brigade from the U.S.A. spoke passionately about the contribution the men from Waterford had made. 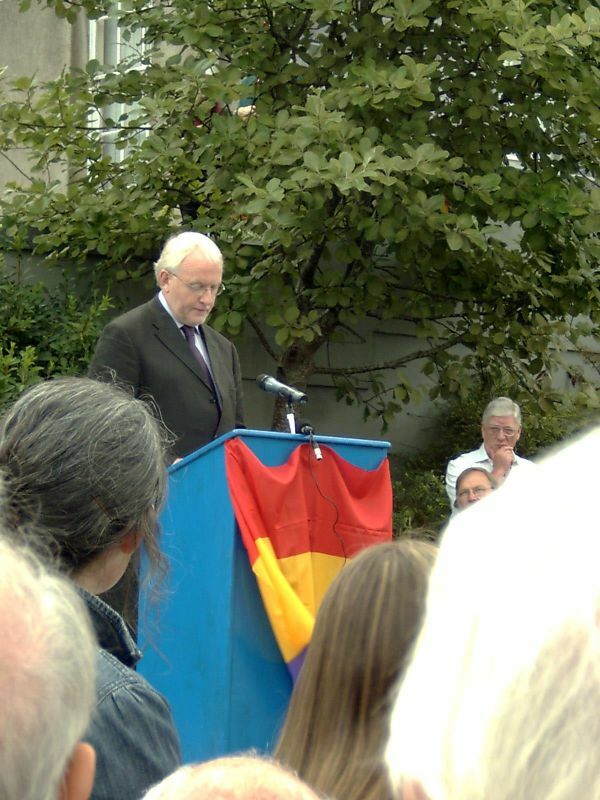 He said that he represented the peace movement in the USA who were vehemently opposed to the War in Iraq and thanked the people of Ireland who demonstrated during President Bush’s recent visit to Ireland. Michael O’Riordan, Cork an Irish veteran of the XVth International Brigade said that sixty six years after the final battles fought by the International Brigades in defence of the Spanish Republic, it was a great honour to pay tribute to the eleven volunteers from Waterford who were among the Irish men who took part in the struggle against the fascist forces of Franco, Mussolini and Hitler. Waterford was to the fore in that struggle from beginning to end. He said that when they returned home from that war these heroes were shabbily treated by both official Waterford and official Ireland in general. 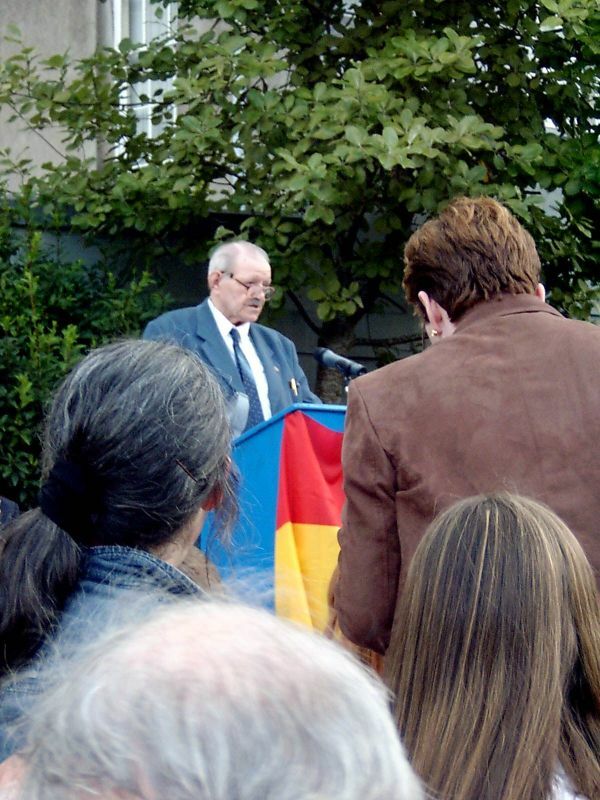 Speaking on behalf of the famlies of the 11 Waterford men Liam Cahill, former RTE correspondent and a cousin of Mossie Quinlan who was killed in the Battle of Jarama said: “This is not some fleeting commemoration, a thing of a single evening, that will fade in memory. We are commemorating these men in the most solid, public way possible – in a manner that will endure. All of these men left an important piece of themselves and their lives in Spain. 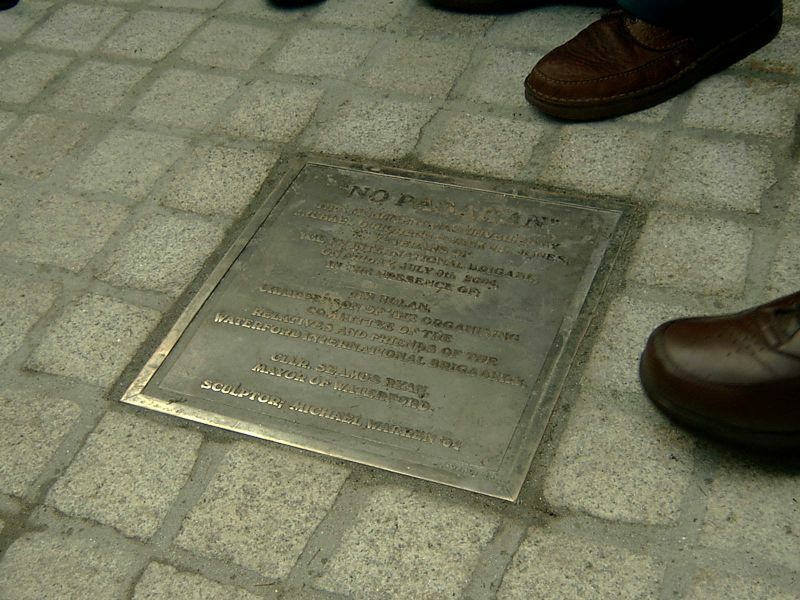 It is entirely appropriate that they are now commemorated in their native city by more than a little piece of Spain – in fact, by several tonnes of it! The positioning of this sculpture on the city’s most noble civic thoroughfare proclaims a great pride in these men and in the sacrifices they made in defence of liberty and democracy. The placing of the sculpture in this prominent place signals a maturity in attitudes in the city. I think we have all learned in recent years that the way to secure peace and liberty for the future is to openly acknowledge, respect and honour every aspect of our traditions and history. For too long these men were forgotten or neglected, except by a faithful few. Their families remembered them proudly but privately, each in their own way. Their names were spoken in quiet family gatherings. 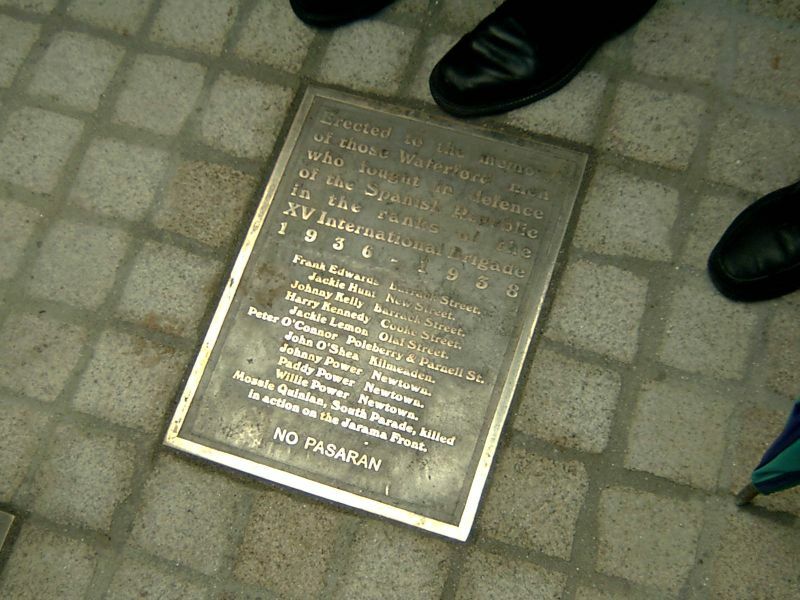 At one time, these men and their families endured much from various authorities in the city because they were marked out, following their fight for Spanish democracy and against fascism. However, this enduring monument now proclaims the public pride of all the citizens of Waterford in what they went out to do. I hope that the monument will become a place of resort for all our citizens – young and old – and for our visitors to come and reflect on the perennial values of democracy, republicanism and socialism, and the continuing need to defend them. To reflect, too, on the immense moral and physical courage it must take to fight for and stand by a cause you believe is right, while all around you, at best, you are ignored, or – at worst – reviled. And, finally, to reflect that no matter what the short-term challenges or difficulties you face, these perennial values win through in the end. I hope the monument it will encourage greater academic and schools study and wider recognition of the honourable part the Left have played in the life of this city over many decades. In that way, we will commemorate these eleven heroes, not just in stone – however beautiful it is – but in our ongoing commitment to peace, justice, equality and tolerance in our daily lives”. The unveiling ceremony concluded with piper Tom Casey (a son-in-law of the late Peter O’Connor) playing the National Anthem. Earlier he had played The Minstrel Boy, a favourite piece of music of Peter O’Connor. Earlier on in the evening the Mayor hosted a Mayoral Reception in City Hall for the families of the 11 Waterford men and presented each family with a framed scroll commemorating the occasion. A social evening in the Granville Hotel followed the unveiling ceremony. On Saturday morning the veterans laid a wreath on the grave of Peter O’Connor in Ballybricken cemetery, and then toured Waterford Treasures at The Granary with Director Eamon McEneaney as their guide. They were each presented with the beautifully illustrated book “Treasures of Waterford” written by Eamon McEneaney and Rosemary Ryan. Also on Friday morning the veterans toured Waterford Crystal where they were received by members of the Joint Negotiating Committee of the ATGWU and Mr. Louis Flynn representing the management and were presented with a commorative crystal glass. 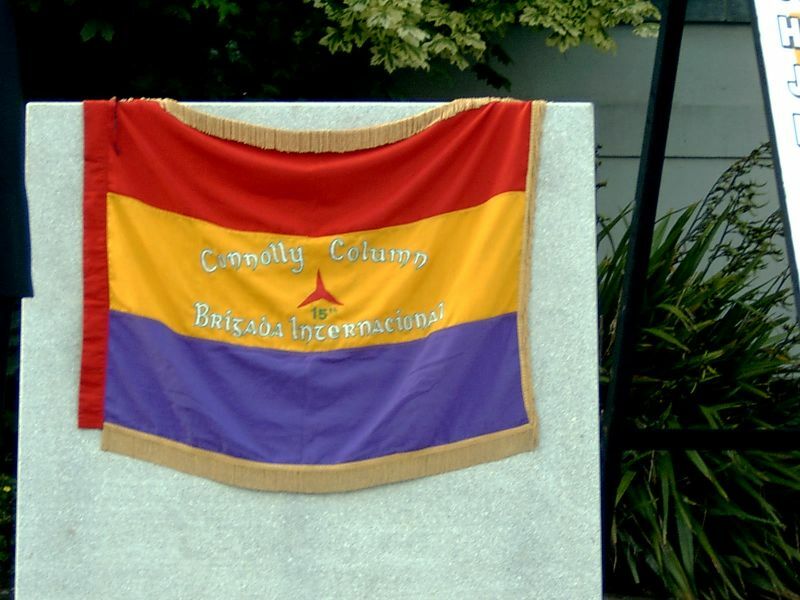 * The full text of La Pasionaria's farewell speech to the International Brigades has been made available here.